Cyber Monday is December 2nd (two weeks from today!) and we’re giving away 100 shopping sprees to celebrate. Winners will be randomly selected based on the number of items that they both purchased and shipped in all of 2013. Every item that was both bought and shipped counts as one entry into the raffle. That means if you both purchased and shipped just one item this year, you’re already entered! To really show our love for Black Friday buyers, items purchased and shipped on Black Friday or Saturday will count as 5 entries! For example, if you bought and shipped ten items over the course of 2013 and buy and ship another ten items on Friday Nov. 29th, that would give you a total of 60 entries into the shopping spree drawing. 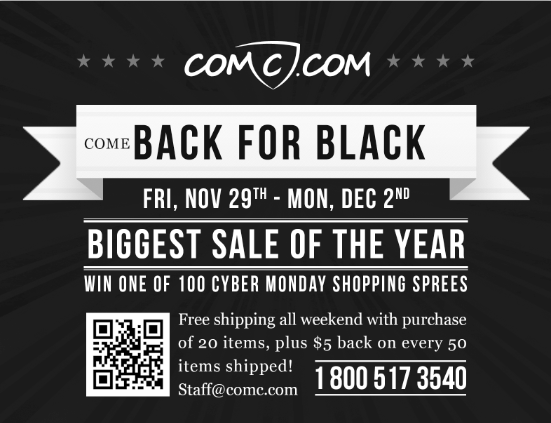 On Sunday, December 1st we will select 100 users at random from the entries to win a Cyber Monday Shopping Spree. One lucky customer will win the grand prize: a $500 shopping spree! The rest of the winners will receive shopping sprees worth between $5 and $100. The winners will be announced on Facebook, so make sure you like our page to see if you win! Winners will have until midnight (Pacific Time) at the end of Cyber Monday to spend their shopping spree and the winnings can be spent on any item or service on the site. PLEASE NOTE: To be eligible to win you must have a COMC account (free to create). Any items which were both purchased and shipped in 2013 from your account or that were bought using the email address associated with your account will count towards your entries. If you did not have an account when you have purchased items, just create a free account using the same email address you used to buy your items, and your purchases will be retroactively credited as entries under your new COMC account name! What if I ship items on Black Friday that I purchased earlier in the year? 2 1/2 entries? Only items both bought and shipped on Black Friday or Saturday will count as five entries. If you have items bought from earlier in 2013 and ship them on either of those days they will count as one entry each. So if I ship stuff I bought this year today or wait until BF/Saturday, I only get one entry regardless? Just wanted to clarify as I have some stuff that I’d like to have shipped ahead of the rush. That’s right; only items purchased *and* shipped on Black Friday or Saturday will count as 5 entries. Everything else counts as 1 entry. What if you are not on Facebook – how do you find out if you won or not? I would like to know about the not being on fb too. I would assume they will email the winners. Super excited for Black Friday on here. Great stuff. Any update to the COMC Hockey Pool?